Olympia-based band The Calaca Kings have several local performances lined up for this summer. The band includes (from left) Fred Doughty, Kennon Mauer, Erin Kilgore, Andrew Doughty and Jordan Doughty. Photo courtesy: The Calaca Kings. Despite its meaning, Dia De Los Muertos is a celebration of life, honoring loved ones who have passed through vibrant festivals filled with music, dance, friends and family – this is the essence that Olympia-based band, The Calaca Kings, hope to embody. The band, a multi-talented group of friends and family with ages ranging from 16 to 64, are set to perform at the Capital Lakefair on Thursday, July 14. You can expect to jam out to some power-blues, funk and rock tunes that evening. According to band member Fred Doughty, The Calaca Kings prepare their songs according to the aura of the crowd. Fred formed the band four years ago with his son, Andrew Doughty, and grandson, Jordan Doughty. Like the other band members, Fred has been playing and writing music his entire life. Since his first professional performance at age 15, Fred has composed over 400 songs, recorded five albums and produced six music videos. In addition to spending time together while doing what they love, Fred also wanted to be able to introduce Andrew and Jordan to the business side of music and guide them on their musical adventure. 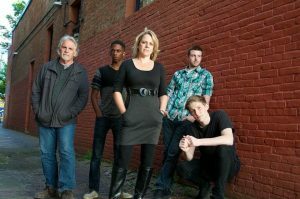 Over the years, The Calaca Kings have acquired four new members – Lyall Smith, Kennon Mauer, Erin Kilgore and John Beach. Lyall and Kennon are cousins of the Doughty’s, though Lyall previously worked with Fred for seven years in another group called The Freckles Brown Band. Erin was also recruited from a band that Fred used to be in, and John is a featured performer at a majority of The Calaca Kings concerts. 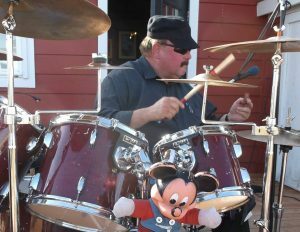 The Calaca Kings drummer Lyall Smith has been making headlines playing in popular Northwest bands since he was young. Photo courtesy: The Calaca Kings. “It’s therapy for the soul,” said Fred. Together, The Calaca Kings have recorded two albums, “NaNa Lanna”, and “Tropical Night” which is still in production and will be available this Fall. At the moment, their eclectic sound can best be described as mostly R&B, Latin pop and a bit of country. The Calaca Kings all agree that performing their music for people is the best part of being in the band. Live performances also allow the band some spontaneity. 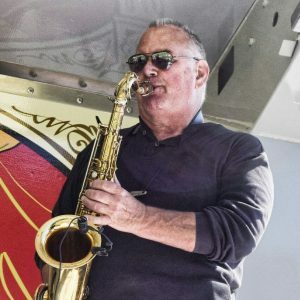 John Beach is The Calaca Kings “Hired Gun” and one of the top saxophone players in the northwest. Photo courtesy: The Calaca Kings. To prepare for performances, the band practices until each song is second nature. Erin likes to record herself singing, so that she can play it back and listen for parts that need improvement. The Calaca Kings have several performances lined up for this summer including the Lacey In Tune concert at Huntamer Park on August, 3, but they are especially excited for the Capital Lakefair. Right now the band is working on their next album, which will be a mixture of Latin pop and island music. After, they would like to put together a blues and funk album. To learn more about The Calaca Kings and keep up with performances and new music, visit their website or like their page on Facebook.